Tony Spurgin graduates with a PhD degree after more than half a century as an engineering professional. 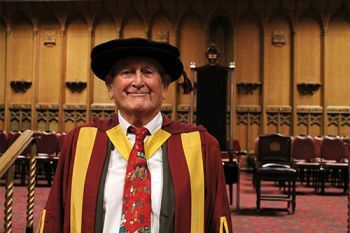 Though Tony Spurgin joined over 2000 students graduating from City University London this month, his success was unique. The 83-year-old resident of San Diego, California, earned a PhD in Engineering with a dissertation titled: "Safety and Economics of Nuclear and High Risk Organisations". Remarkably, he completed the degree as a part-time candidate in three years, which is the standard duration for a full-time doctoral student. "In those days I enjoyed most of the subjects which were taught by excellent tutors. These included topics such as mathematics, metallurgy, aerodynamics and aircraft performance. I was also the recipient of a team tie for water polo and a full cap in rugby." Enriched by a treasure trove of professional experiences, Spurgin has spent over half a century as an engineering professional in areas such as aerodynamics, control design and simulation, accident analyses involving nuclear power plants, human reliability assessments, economic risk and the impact of decision making. He has published more than 50 research papers on human reliability assessment, training, control and protection system design and data collection topics. His book, Human Reliability Assessment: Theory and Practice, was published in 2009 by CRC Press. He is a senior member of the Institute of Electrical and Electronics Engineers (IEEE) and a member of the Institution of Mechanical Engineers (IMechE). "The guidance provided by Professor Stupples was crucial. He played an important role in assisting me to properly formulate and answer my research questions and gave me the confidence to produce original research". "My research will have an effect on the relationship between safety and economics in the nuclear industry and the role of management in that process. In the past, there has been a separation between safety implications and the business of the nuclear industry. This has not been helped by the attitudes of regulators to safety and the limited thinking about the impact of regulations on the viability of the industry. There has not been much attention paid to clean-up costs following accidents." He says that through the acquisition of his doctoral degree, City has given him "an opportunity to partake of continued learning, mirroring changes in technology and understanding new ideas and concepts."